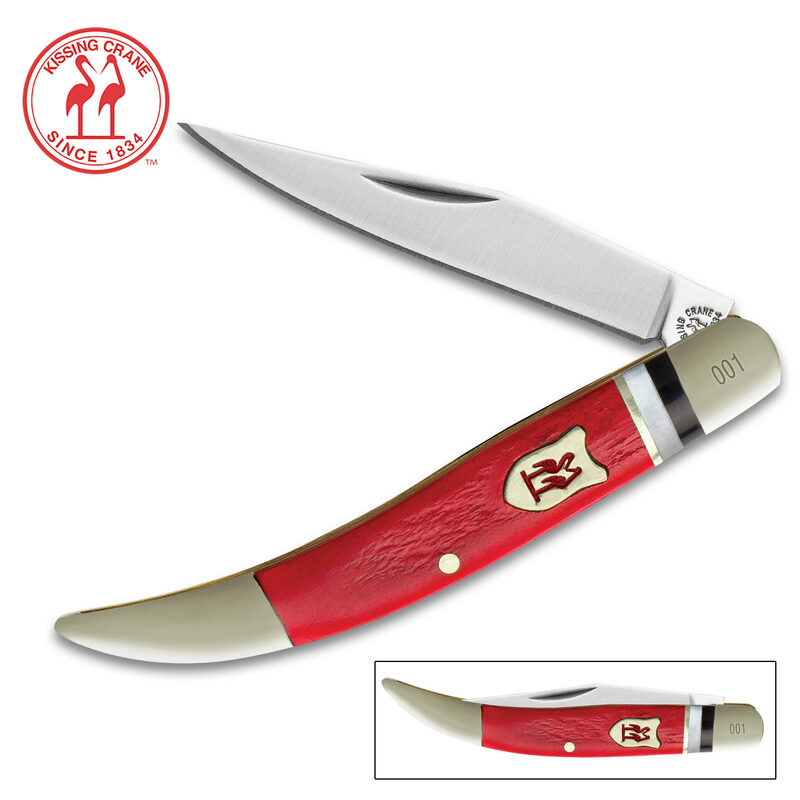 Kissing Crane Red Jigged Bone Toothpick Folder / Pocket Knife - 440 Stainless Steel - Genuine Bone - Nickel Silver Bolsters - Faux Mother of Pearl Spacers - 3" | BUDK.com - Knives & Swords At The Lowest Prices! 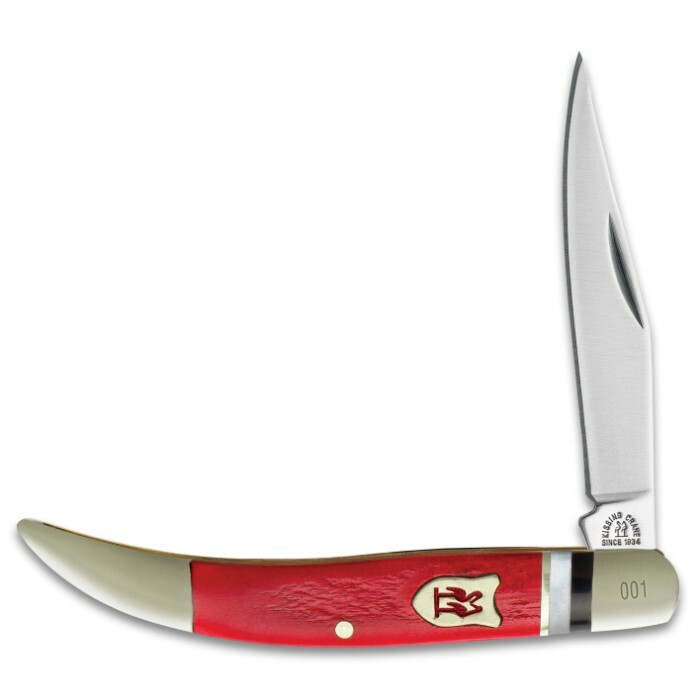 Kissing Crane Red Jigged Bone Toothpick Folder / Pocket Knife - 440 Stainless Steel - Genuine Bone - Nickel Silver Bolsters - Faux Mother of Pearl Spacers - 3"
This vibrant red pocket knife features a razor sharp 440 stainless steel toothpick blade and a handsome genuine bone handle with rustic jigging. Faux mother of pearl and black synthetic spacers offset the brilliant crimson beautifully, as do the delicately polished nickel silver bolsters and classic Kissing Crane shield. Big enough for tough jobs yet remarkably easy to carry - even in a front shirt pocket! 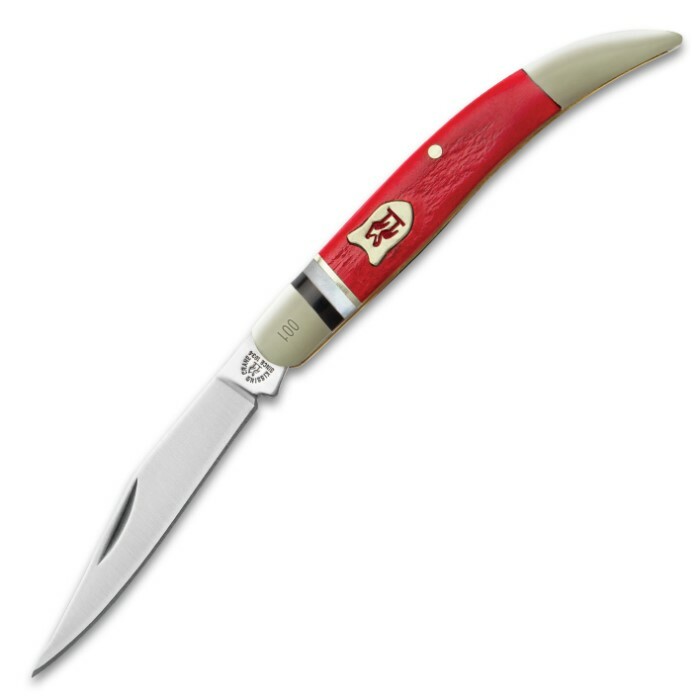 The knife I received is not quite as rich in color as the one pictured. The texture on the front scale is smooth, and the edges are somewhat washed out. The effect is whitish to pinkish to reddish near the emblem. Other than that, the knife is as described, and looks to be of good quality, with no gaps between bone and edges. Overall, I like the knife, but it's just not as vibrant as the picture suggests.